This is a very healthy, tasty and instant dosa. 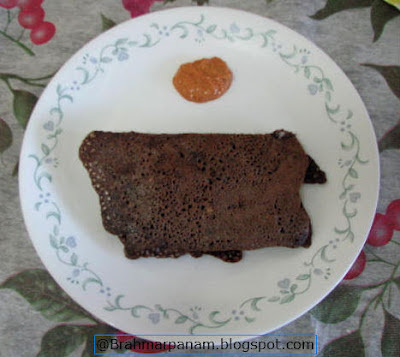 Even those who dont like ragi will love this dosa. Don't get intimidated by the colour of the dosa as ragi is always that colour but it is very tasty and nutritious. Mix all the ingrdients in a big bowl to a running consistency. Heat a skillet on high and pour a ladle of the ragi dosa batter on it and reduce the heat to medium. You cannot spread the batter like the normal dosa, so you have to pour it in a circular motion. Add a little oil around the dosa so that it doesn't stick to the skillet. When it gets cooked and becomes crisp, set the heat on high again and turn it over for a few seconds and serve. Repeat the process for all the remaining dosas and serve them hot with chutney.